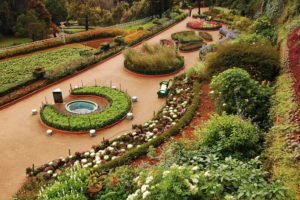 Ooty is popularly called as the queen of hill stations. 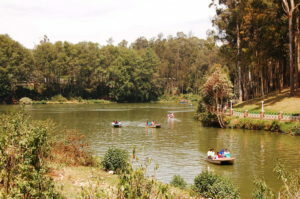 Ooty is short for Ootacamand, and is also called as Udagamandalam. 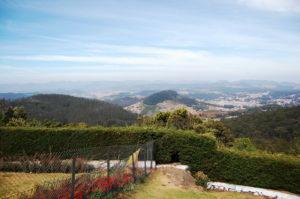 Ooty is a picturesque hill station and has become quite commercialized in the recent years. You can see enough visitors on any weekend throughout the year. Getting to Ooty itself is an experience. 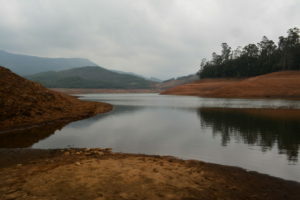 You can reach Ooty either from Coimbatore or from Mysore. 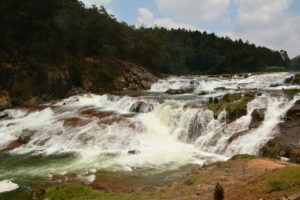 Each of these routes are very picturesque and you will take multiple stops even before reaching Ooty. If you are coming from Mysore (or Bangalore), you can take Mysore-Ooty highway to reach Bandipur National Park, then cross over to Mudumalai Wildlife Sanctuary. From Mudumalai, you will find two routes to Ooty. First, continue on the highway, enjoying the 66 km drive through the huge eucalyptus trees, and the Nilgiri shola forests to reach Ooty. On this route, you can even take several pit stops, which you would eventually cover otherwise. Needle Rock View Point, Pykara Falls, Pykara Lake, Film Shooting Spot, Kamraj Sagar Dam Backwaters are located on this route, and you can visit them even before reaching Ooty. The other route to Ooty from Mudumalai is actually shorter (36 km). The route passes through Masinagudi (a small village on the outskirts of Mudumalai Wildlife Sanctuary). If you are lucky, you will spot several wild animals on this route. Deer, bisons, peacocks and elephants are often spotted on this route. On rare occasions, bears and leopards are also seen! After you cross Masinagudi, you have to drive through a steep ascent, with 36 steep hair-pin bends to reach Ooty. If you get tired of driving through the hair pin bends, you can take a break at Kalhatti Falls, which is about 500m walk inside the forest from the road. If you are a beginner to driving, do not drive down (Ooty to Mudumalai) on this route. Few kms before the hair pin bends start! You can also reach Ooty from Coimbatore side. The drive on this route is equally scenic, as the route passes through several green valleys. It is sometimes exciting to see the toy train pass next to you 🙂 You can also reach Ooty via the toy train from Mettupalyam. The toy train route gives more scenic glimpses of the valley, and on a clear day, your camera will be delighted to capture as many landscapes as possible! 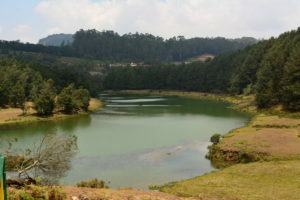 Ooty has several places to explore. From more commercialized (and “touristy”) destinations, to calm and peaceful less explored places too. Some of the places have their own respective pages in this site (see below).